With a population of just 148, the Kakapo (Strigops habroptilus) is one of the rarest parrots on earth. Its decline is due to habitat degradation and clearance, and the introduction of predators such as stoats and cats. Progress and outcomes: Heroic actions by the NZ Dept of Conservation have helped to stabilize the species' population. In late 1995 WPT trustee and veterinarian Andrew Greenwood was invited by Kakapo Recovery head Don Merton to visit New Zealand and advise the team on fine tuning the supplementary diet fed to the birds, identifying environmental cues which may trigger breeding behaviours, and techniques to test fertility in free-ranging male birds. Also added was sperm collection, storage and artificial insemination techniques, health monitoring, minimizing disease and contamination risks, establishing indicators of age in the birds, captive management and hand rearing of chicks. 2016 was a banner year with 32 chicks fledging. 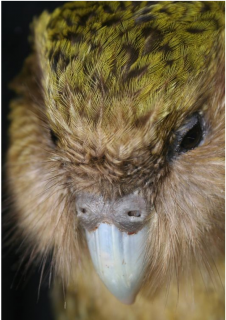 Focus of future work: WPT will continue aiding Kakapo recovery with a focus towards assisting fundraising and awareness efforts. With your help we can complete these important tasks to better understand the species, and continue to deliver effective solutions to further their conservation. History: The Kakapo, Strigops habroptilus, was once seen throughout most of the North, South and Stewart Islands of New Zealand. This species has seen its population decline by >80% in the last one hundred years (P. Jansen in litt. 2004, D. Merton in litt. 2005, Merton 2009) and by 1976 had been reduced to 18 birds, all males, in Fiordland. In 1977, a rapidly diminishing population of about 150 birds was discovered on Stewart Island. After transfers to different islands and intensive conservation, the current population stands at 77 breeding adults, and 125 birds in total. Ecology: The Kakapo is a ground dweller of forest substrate and low scrubland. It lives from sea level to 1200m (3938 ft) on the islands of Maud, Inner Chetwode, Pearl and Codfish, all off the coast of New Zealand. These nocturnal parrots feed on leaves, roots, fruits, ferns, mosses, fungi and seeds. Wild birds are also supplemented with dried rimu fruits, green walnuts, pine conelets and a concentrated commercial pellet.